Article submitted by Amelina Mendoza, Challenge Leader. Challenge Greater Sacramento in Elk Grove has been around for the past 7 years, making an impact on the lives of the girls, their families, the parish and the community. 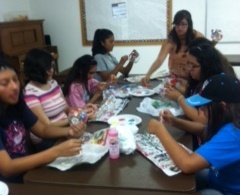 The group puts a great emphasis on helping the girls grow spiritually and be proud of their Catholic faith. Through the years, they have put on weekend retreats and through the year, they organize and host activities to help the girls really live their faith. 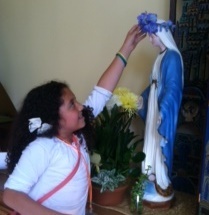 Last May, they did a May Crowning in honor of Mary, our heavenly mother and as a special activity for their moms. Amelina Mendoza, shared that the activity was truly touching for the mothers and daughters involved. These simple experiences are ones that the girls and moms will remember. The group also focuses on service and participating in activities in the local parish and community to make a difference. One example was the “Mom & Me Project” which they did in conjunction with the 40 days of life Campaign in their diocese.